Milton’s is a quintessential NY Jewish deli transplanted in San Diego and has been warmly accepted by the people as it is bustling on just about any day. Not coincidentally, Milton’s is also the name of the nationally recognized brand of baked good, all of which they also carry in the front of the restaurant. The front counter also carries various meats, cheeses and freshly baked goods so you can take a little bit of Milton’s home as well. After Leon and Michelle introduced us to Milton’s Delicatessen a few months ago, we have become steady patrons because of this lovely dish. I love having this dish on a lazy weekend morning because that is exactly what you are going to be after you eat this… lazy! The corned beef is perfectly seasoned and there is a even proportion of veggies to meat in the dish. I live for the home style potatoes too… the crisped sides of the potatoes are a perfect compliment to the steaming soft mounds of white potatoes inside and taste just delish with some ketchup and a few squirts of hot sauce. 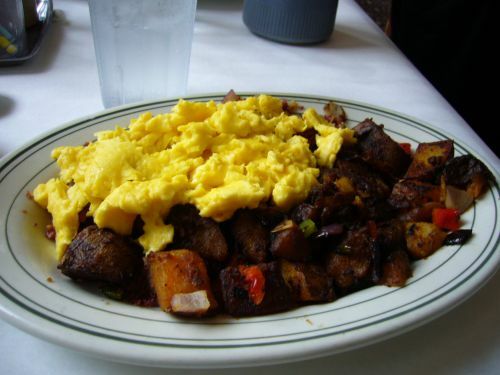 You also get 2 eggs prepared the way you want, and a choice of a bialy/toast/or bagel. I always get the bialey…. a hole-less bagel (why would you get a bagel if you can get this?). All this for $10.95 and I usually end up not being able to finish the dish so I try to share or just save it for the next morning and make it a yummy left over breakfast. A definite recommended place to hit up for some feel good food.